It will be no surprise that data on its own has little value, it’s the meaning of that data that brings any kind of benefit. But what value does it bring us? We know that data offers us information if we can make sense of it. Data is gathered from events, transactions, communications, etc. and this can be referred to as noise. Data can be considered as structured noise if we do not know what it is telling us. The chart below shows how noise, through various convertions can bring us wisdom on past present and even future events. I’ve seen first-hand how data has been converted to information upon which business decisions have been made, there can be armies of people and/or banks of processors involved in the conversion process. Using this information wisely will often bring us knowledge. For example, data about your car journey to work each day may provide you with the information that it takes on average 22 minutes. You may also be able to obtain information from the data of start and end times of your journeys. From this you may be able to assess the optimum start times that get you to your destination in the shortest possible time. 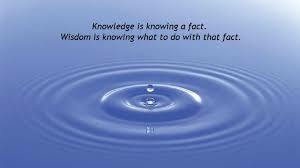 Using this information to your advantage can be considered wisdom. Putting this into a business context: You may require to make journeys in the most fuel and resource efficient way possible. The wisdom of how this can be achieved will be by having knowledge of what the most efficient journey times are based upon the information being made available from the data captured from the events. However, this can be achieved purely by accident by having the information in the first place; it may have been collected for completely different business reasons. 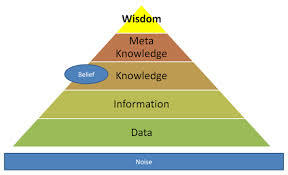 Wisdom is therefore knowing what you want to be wise about and then converting down the pyramid to ensure you collect the right data. Sadly, I’ve seen in too many instances that data is collected because it ‘can be’ and then used for whatever information it can tell you. This will probably result in some data being collected without purpose as well as the wrong kind of data to give you this wisdom. In summary then, it is far better to understand what areas of wisdom you require (top down approach) as opposed to the collection data and hoping it will have a use (bottom down approach). ← If data is an asset, what type of asset is it? Great article, Ian. 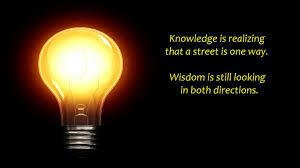 To me the most important point it makes is that that knowledge and wisdom do not come from data but from information. Digital data in an enterprise is merely a storage mechanism for elements of information. If the data does not represent information, then it is of no value whatsoever to the enterprise.